Leave it to The Impulsive Buy to spot new and exciting things on Target's shelves before I do. 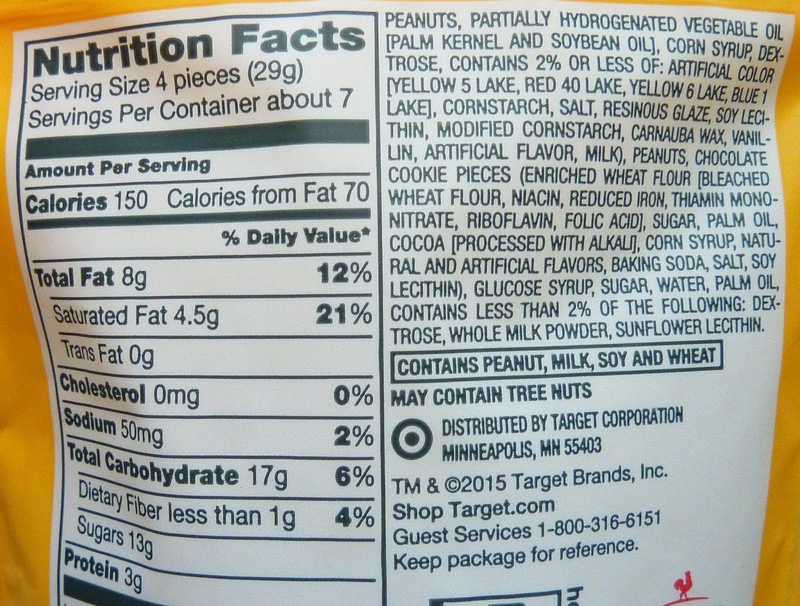 In my defense, many of the Target locations in my area seem to not carry a lot of their interesting newfangled items, such as Cupid's Crunch or Bunny Bait trail mixes. In fact, the employees at the stores I checked hadn't even heard of them (and sort of implied in a nice way that I might have been making them up or that they weren't real). But as you can see, if you follow the links above, they did, in fact, exist. However, I must admit I've been slacking and not paying much attention to new stuff at Target lately. I've just been taking it for granted that our sad local Targets won't get any intriguing new stuff. 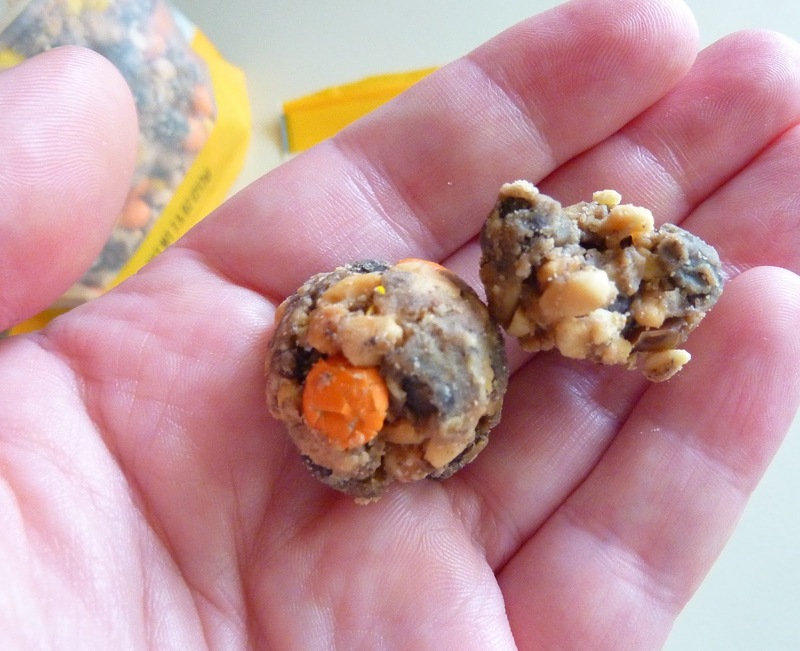 Fortunately, they carry several varieties of these cookie-esque snack bites in resealable bags. I've tried two of them so far. This is the better one of the pair, and I'll get to that other one on this blog in due time. First of all, if you like peanut butter cookies and Reese's Pieces type candies, you'll probably like these snacks. It's like someone took peanut butter candy shell treats and traditional cookies, smashed them up into bits, and then re-shaped them into little mounds of cookie crumbs and candy fused together with peanut butter. They're a bit more messy than traditional cookies, but if you take fairly large bites when you're eating a cookie, you can probably just pop these "snack bites" into your mouth whole, thus avoiding some of the mess. They're slightly crispy, and they have a nice "mouthfeel" resulting from the combination of at least three distinct textures (cookie pieces, candy pieces, and the "glue" that holds them all together). They're a far cry from the health-conscious Simply Balanced line of foods that Target has pushed so vigorously these past few years. 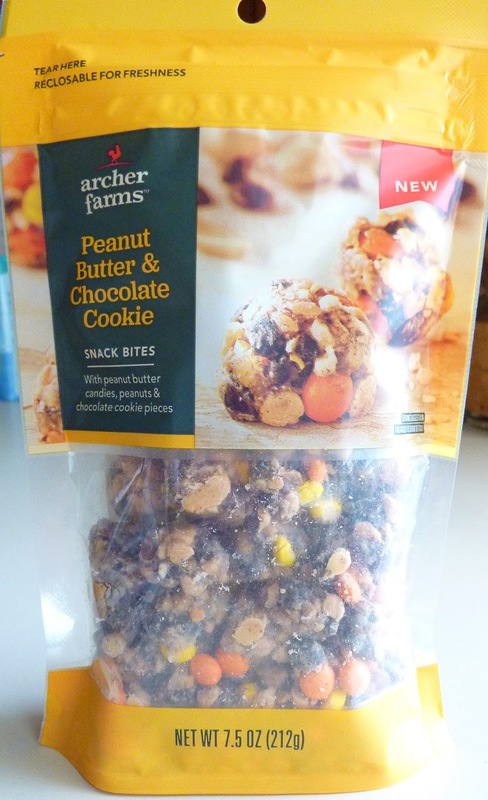 It seems like Archer Farms might be the purveyor of tasty junk food now that Target's lighter fare has found a different identity. 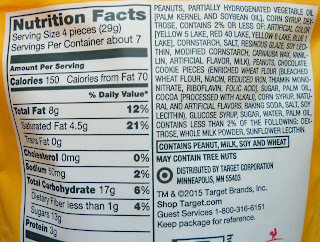 Not only is the second ingredient a partially hydrogenated oil, but there's a fair amount of saturated fat here, too—especially considering a "serving size" is only four bite-size pieces. If I took nutrition info into consideration—or, perhaps, if I valued my own life just a little more—I should probably have given these a lower score. But they're tasty enough in my book to deserve 8 out of 10 stars.